1976 Most exciting to 1976 was the introduction of the Mustang Cobra II upgrade package which could be added to any of the hatchback body styles including the Mach 1. 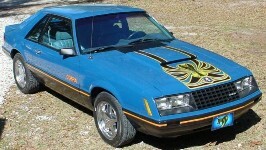 The Cobra II package included front and rear spoilers, simulated hood scoop, quarter window louvers, and snake emblems on a white with blue stripes or black with gold stripes paint scheme. The Cobra graphics designed by Jim Wangers credited for fathering the Pontiac GTO and the entire $325 option package okayed by Carroll Shelby. See our 1976 Cobra Data Explorer for more information. 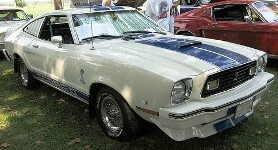 1977 The 1977 Mustang Cobra II came in white with blue stripes, blue with white stripes, or black with gold stripes. New in 1977 the Cobra could come with white with red stripes and white with green stripes. Early 1977 Cobras had the body side lettering low on the door, later in the year they were higher up. The $535 Cobra II options package required $58 power brakes. 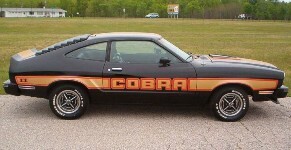 21% of all Mustang hatchbacks sold in 1977 were ordered with the Cobra II package. The Cobra package came with rack and pinion steering, front disc brakes, the 2.3 liter 4 cylinder engine, racing stripes, blacked out grille, black racing mirrors, rear window louvers, rear quarter window louvers, front air dam, a non-functional rear opening hood scoop, rear wing, aluminum instrument and door panels, Cobra emblems, and styled steel wheels. See our 1977 Cobra Data Explorer for more information. 1978 The 1978 Mustang Cobra II got a new stripe tape treatment mid-year with tri-color tape stripes, large "Cobra" block letters mid level on the side and decklid spoiler, a Cobra decal on the back spoiler, and a Cobra II snake emblem on a black grille. Standard on the 1978 Cobra came flat black window moldings, black quarter-window and back-light louvers, black rocker panels, and dual color-keyed racing mirrors. See our 1978 Cobra Data Explorer for more information. 1978 New to 1978, was the King Cobra option at $1277. The "Boss of the Mustang stable" had a giant snake decal on the hood and pinstripping around the windows, decklid, wheel lips, rocker panels, belt, and over-the-roof area; a large front and rear spoiler, rear quarter flares, spoke wheels, and the 5.0L V8. See our 1978 Cobra Data Explorer for more information. 1979 The 1979 Mustang Cobra options package was originally $1179 and included the 2.3 liter, turbo-charged, four cylinder; hood scoop; forged metric aluminum wheels with three main wide slotted spokes(replaced with 1993+ wheels on this car); blacked out window trim, body side and bumper trim, and lower body; sport mirrors, color keyed rear quarter window louver panels; tachometer and instrument cluster panel; and sport tuned exhaust with bright tailpipe tips. The hood graphics was an additional $78. See our 1979 Cobra Data Explorer for more information. 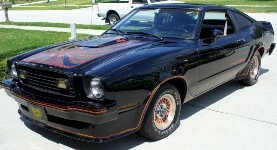 1980 The 1980 Mustang Cobra package included an aerodynamic front and rear end. 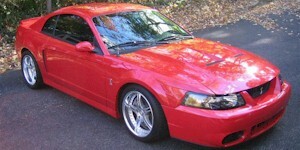 This package option was so significant that its cost was $1482, with the Cobra hood graphics costing an additional $88. The Cobra package was patterned off the 1979 pace car model and came with dual sport mirrors, sport tuned exhaust with bright tailpipe extensions, forged metric aluminum wheels, special instrument cluster, 8000 rpm tachometer, and a turbocharged 255ci, 4.2 liter, V8 engine. This car has optional rear quarter window louvers which cover the lower window "Cobra" lettered decal. See our 1980 Cobra Data Explorer for more information. 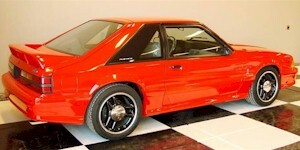 1981 The 1981 Mustang Cobra continued to be the only sports model for the Mustang with blacked out side mirrors and interior trim accents, rear facing hood scoop, 1979 Mustang pace car front end and rear spoiler, TRX wheels, added to the standard 2.3L twin turbo 4-cylinder engine connected to sport tuned exhaust. Upgrades included the 4.2L V8 engine. A Cobra package taping delete option existed to save $65 but the special, large Cobra hood decal was an additional $95 option. Although the Cobra came only in a hatchback, a sports package was also available for the hatchback or coupe which included engine upgrades, blacked out treatment, sport wheels, rear window louvers on the hatchback and convertible looking carriage roof for the coupe. See our 1981 Cobra Data Explorer for more information. 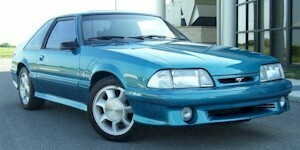 1993 1993 saw the introduction of the Mustang Cobra built by Ford's Special Vehicle team (SVT). The SVT Cobra had a modified body panels, better handling, and 235 horsepower. The front grille is similar to the GT, but the top has an opening with a horse emblem and the lower has removed side scoops. The rear was a one piece design with exhaust cutouts and a special trunk lid spoiler. A special Cobra R model was built for racing in 1993. See our 1993 SVT Cobra Data Explorer for more information. 1993 Only 107 Limited Edition SVT Cobra R Mustangs were built in 1993. They were all Vibrant Red hatchbacks. They were stripped of their rear seats, air conditioning, and sound systems. This made them lighter for racing. 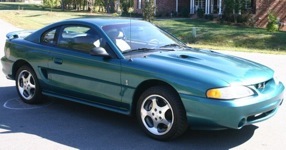 They had suspension upgrades and 3-spoke special wheels to be used on the 1994 Mustang GT. See our 1993 SVT Cobra Data Explorer for more information. 1994 The 1994 SVT Mustang Cobra body was redesigned along with the entire 1994 Mustang bodyline. The Cobra received its own unique front fascia, round fog lamps (GT had rectangular), rear spoiler, Cobra emblems, and its own 240hp 5.0L V8 engine. The Cobra only came in Rio Red, Crystal White, and Black. See our 1994 SVT Cobra Data Explorer for more information. 1994 The 1994 Indianapolis Pace Car Cobra was limited to 1000 convertibles and came only in Rio Red, had special graphics and the 240hp (at 5000rpm), 5.0 liter (320ci), overhead valve, Cobra V8 engine. Cobra options included power convertible top, air conditioning, power driver's seat, power windows; power door locks, power driver's side mirror, AM/FM/cassette radio with CD player, 4 wheel disc brakes, chrome 17" wheels, and Goodyear Eagle GS-C P255/45/ZR17 tires. See our 1994 SVT Cobra Data Explorer for more information. 1995 The 1995 SVT Cobra came with the 240hp (at 4800rpm), 302 cubic inch (5.0 liter), electronic fuel injected, V8 engine; a unique front fascia; Cobra emblems, and only came in black, red, or white. See our 1995 SVT Cobra Data Explorer for more information. 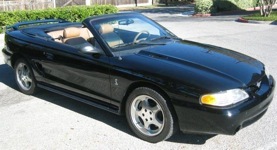 1995 In 1995, Ford made 250 Cobra R coupes. The huge 5.8L (351 cubic inch) V8 is so big that the standard hood did not work. A special taller fiberglass hood was created. This baby was built for racing. It has a factory 20-gallon fuel cell, a engine oil cooler, and a power steering cooler. All Cobra R Mustangs were painted Crystal White with tan colored interiors. See our 1995 SVT Cobra Data Explorer for more information. 1996 The 1996 SVT Cobra came with an all new engine. The hand built 4.6L 32-valve double overhead cam V8. A new, Cobra exclusive, color called Mystic was offered which color shifted from blue to purple to green and black. It was an $815 option. Other exterior colors continued to be limited to red, black, and white. See our 1996 SVT Cobra Data Explorer for more information. 1997 The 1997 SVT Cobra saw only a couple of changes over the 1996 model. The grille opening was enlarged and a new color, Pacific Green, was offered. Optional equipment continued to be limited to just the Preferred Equipment Package (Mach 460 sound system and leather seats) and the rear decklid spoiler. See our 1997 SVT Cobra Data Explorer for more information. 1998 The 1998 SVT Cobra saw a few changes from 1997; yellow paint was available, a new 5-spoke wheel design was used, the under-hood tower brace was redesigned,a and there were a few interior changes. Standard equipment was ABS, sport seats, the premium sound system, power equipment, rear window defroster, AC, cruise control, floor mats, lighted visor mirrors, and key-less entry. Optional equipment was few; extra interior leather trim and a rear spoiler. See our 1998 SVT Cobra Data Explorer for more information. 1999 The 1999 SVT Cobra saw the redesigned features of the Mustang platform. The 4.6L engine was altered to 320 horsepower. The 1999 Cobra received a new independent rear suspension. Another new 5-spoke 17-inch was introduced. Out was yellow and blue paint, but in was a green paint offering. 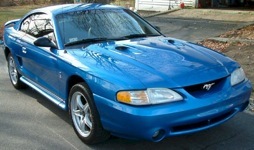 See our 1999 SVT Cobra Data Explorer for more information. 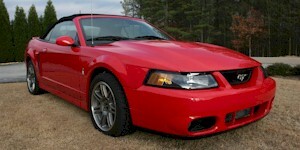 2000 Only 300 SVT Cobra R Mustangs were built in 2000 and all came in Performance Red. 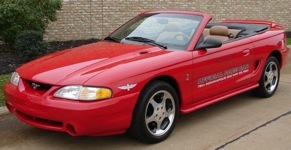 It is generally accepted that there were no standard SVT Cobras built in 2000 although we have found a 2000 Ford sales brochure for a Mustang Cobra. The Cobra R has a huge 5.4L V8 engine that puts out 395 horsepower, Canton 8-quart oil pan, McCleod aluminum flywheel, a Tremec T-56 6-speed transmission, 4 inch aluminum drive shaft, 8.8 inch short shaft 31-spline fully independent rear suspension, Brembo 4-piston calipers with 13-inch rotors, Eibach 800lb/750lb springs, Bistien shock absorbers, Borla mufflers with side exit exhaust, and Recaro seats. 2001 The 2001 SVT Cobra Mustang came with a special Cobra 320hp (at 6000rpm), 281 cubic inch, 4.6 liter, electronic fuel injected, double overhead cam, V8. The 2001 Cobra came in 8 of the standard 2001 Mustang colors(not green, silver, or white), sport seats, power equipment group, rear spoiler, polished wheels, and Cobra letters embossed on the rear bumper. 2002 Limited to 100 and all shipped to Australia the 2002 SVT Cobra Mustang came with a special Cobra 320hp (at 6000rpm), 281 cubic inch, 4.6 liter, electronic fuel injected, double overhead cam, V8. Just as in 2001 the 2002 Cobra came in 8 of the standard 2001 Mustang colors(not green, silver, or white), sport seats, power equipment group, rear spoiler, polished wheels, and Cobra letters embossed on the rear bumper. 2003 The 2003 SVT Cobra was offered in both the convertible and coupe body styles. Besides a host of trim modifications the engine consists of a hand-built 4.6L DOHC Supercharged V8. This engine is a monster with 390 horsepower and 390 foot-pounds of torque. 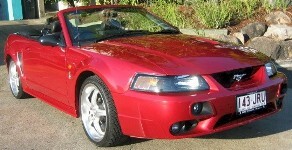 The 2003 Cobra was code named the "Terminator" by the SVT group. It is said that this model Terminates any competition between the Cobra and the General Motor's Trans Am and Camaro models. 2003 2003 was the 10th year the SVT Cobra was offered. This event was commemorated with the release of the Limited Edition 2003 10th Anniversary SVT Cobra. 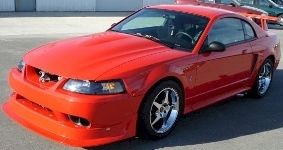 The limited edition modifications over the normal Cobra included: carbon fiber patterned leather on the top of the steering wheel, carbon fiber leather on the shifter and hand brake, red window switch bezels, red seats inserts, red painted brake calipers all the way around, and big 17x9 inch 10th Anniversary wheels. 2004 The 2004 SVT Cobra came in both the coupe and convertible body styles. Features included: the big 390 horsepower 4.6L DOHC Supercharged V8 engine, inverted dual hood scoops, a unique front bumper, lowered spoiler, 6-speed manual transmission (only), and unique 17-inch chrome aluminum wheels. 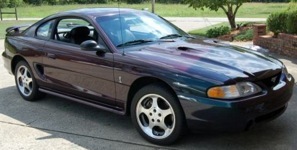 The Mystichrome paint was also available on the 2004 Cobra model only.